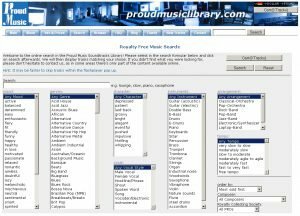 The Proud Music Library contains a wide spectrum of music genres online. You can download the tracks of different genres directly and license them for your projects in marketing, advertisement, movie, electronic games or background music. Therefor the listed titles in the Proud Music Library are attributed to particular genres. Because of that the query will deliver accurate results. Beside the research of genres you can also get search results after mood, character, tempo, instrumental, etc.